We at EffOne develop active web-applications using various application servers and web-containers. We implement J2EE for our client's custom application development requirements and also provide platform independence which helps in developing cross-platform portable solutions. Our Java team develop simple to complex enterprise-scale software solutions and e-business applications based on the J2EE platform. Our Java developers and programmers design multi-tier software solutions that support a service-oriented architecture. We offer consulting/programming skills in different development platforms, including Java, PHP, Scala and .Net, which give us the flexibility to select the right technologies for diverse software components. 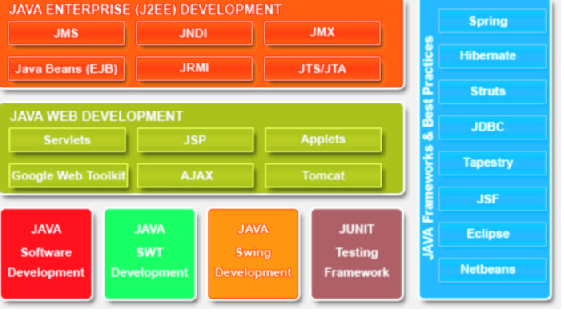 EffOne java team use up-to-date Java tools to develop multi-platform desktop applications and enrich client solutions. EffOne develop user interfaces that have advanced graphics and maintain brand-identity of the software products. Our Java team at EffOne uses web Services very successfully to provide elegant integration interfaces in many assignments for our clients globally. The Web Service middle tier technology has enabled us to make various technically distinct software to communicate with each other. EffOne has worked with different Data Base Management Systems starting from MySQL and PostgeSQL, to Oracle and MS SQL. It is formidable to imagine a complicated application without an enterprise database and EffOne excels in these areas of expertise. EffOne uses J2ME platform to provide a convenient and flexible environment for applications running on hand held devices such as mobile phones or PDAs. Our Java Developers at EffOne also build basic MIDP applications (MIDlets) and incorporate enhanced multi-media into MIDP-based applications. EffOne java team has rich experience in JSP and Struts and implement these for development of web based and eCommerce applications. EffOne also implements AJAX with the same to bring richness in the front end. EffOne Java developers implement Enterprise JavaBeans (EJBs) to develop n-tier database and legacy connectivity solutions for Web applications, Java APIs and Java Database connectivity solutions. The line of business web application development is one of the EffOne Java Team's core competences. We have successfully delivered Java-based solutions for businesses of various sizes, including Fortune 500 companies. EffOne team has in-depth knowledge and experience in programming persistence layer and designing databases for web applications including apps that may require very content processing and intensive data. The EffOne team is quite adept in utilizing both these Java native capabilities (JPA, JPQL, JDBC, JCA, custom ORM programming) and open-source persistence frameworks (Hibernate, iBATIS, EclipseLink and others). EffOne develops transparent well-organized storages and reusable data processing modules which help in building smart applications. Transparent object-relational mapping which reduces programming and development efforts, cutting application maintenance costs enabling uncomplicated and effortless modifications in the future. Our belief is that functionality development is considerable compared to software architecting and coding. Keeping business-driven development logic in mind we at EffOne apply the best Java practices and methodology for interpreting, prototyping and developing application business layer. We use BOM, UML and BPMN to formalize business process and help manage requirements and issue project-related documentation. We apply most effective architectural approaches such as layered application stack with decoupled business logic layer. We are quite traditional with Service-Oriented Architecture in line with SOA integration principles and JBI specifications. We always use proven Java design patterns to develop lean, well-documented code and ensure smooth knowledge transfer. The EffOne UI design & Usability practice serves a platform for executing projects requiring complex yet easy to use web interfaces to support complex business practices and workflows. Our skills and extensive experience in JSP, FreeMarker related frameworks, open-source components allow us to resolve challenging tasks of dynamic data visualization (interactive dashboards, charts, grids, content blocks etc. ), context-driven controls and establish fine, conducive and cross-browser compatible layouts. Our solid AJAX expertise (as well as experience in Flash and HTML5) supports extend web interface interactivity and make it agile, consistent and likeable which is especially important for SaaS solutions and other Rich Internet Applications.